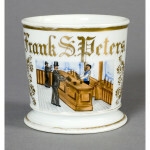 Shaving Mugs featuring Bankers or Bank scenes are not especially common, because it was generally a time when there were not a huge number of banks, especially in smaller towns. Bankers’ mugs often have scenes of the Banker serving clients at their teller window while others have images of a bank building. 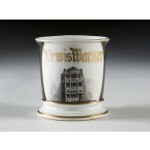 Bankers were fairly wealthy during this time and it’s no surprise to see really well decorated and elaborately detailed mugs for this profession.